Sometimes customer scenarios using Gherkin (Cucumber, SpecFlow etc.) can be harder to read than necessary. Once there’s more than one “And” line in a row, I find that there’s more clutter than I’d like and it doesn’t flow as well when I read it. Let’s take this example scenario of upgrading a fremium service. Scenario: Upgrade my SomeService subscription from Basic to Pro. Note how I’ve put in a “Then” step that segues from the “When” to the actual expectations. Asterisks can replace the opening keyword of any type of step, but using them in this way for Given or When steps could be a scenario-smell, suggesting that the scenario has too much detail or those steps are at the wrong level of abstraction. Using asterisks and Segue Steps are most appropriate in “Then” statements with two or more “And” lines. After doing this, reading scenarios without asterisks and ‘Segue Steps’ now feels like the “And Then” scene from “Dude, Where’s my Car”…And then? I hope you find it useful to write better scenarios too… And then? And then? And theeeeeeeeeeeeen! And thenandthenandthen! Special thanks to Andy Palmer for reviewing this blog post and helping me say it with fewer words. Actions: The specific steps or interactions we execute to complete the task. I showed how many scenarios (acceptance tests) are pitched at too low a level. They’re often at the action level, detailing every field filled in and every button clicked. This is too low-level. Instead, we want to express the business process… the tasks involved in fulfilling a goal. The actions should be expressed in the code (or step-definitions), not the plain-text scenarios. Pitching the scenarios at the action level makes scenarios much harder to maintain – especially when the user-interface changes. But, perhaps more importantly, they don’t express what’s of interest to the business. We’ve taken many of the lessons we’ve learned using BDD tools to address these problems and begun to distill the various heuristics and design ideas (patterns) that emerged into a single open-source extension to cucumber – cukesalad. Treat each step-definition as a class of task. Like other classes, have one file per step-definition and organise them so they’re easy to find. Name each file using the text used in the scenario. Cukesalad is the ongoing expression of us mercilessly refactoring a ‘typical’ Cucumber project. At the moment, it is more of an illustration of the concepts and ideas… but some are already using it on their day-to-day projects. Check it out… try it out… and let us know what you think. Go to http://cukesalad.info – for more info, or checkout the talk I gave at CukeUp, hosted at SkillsMatter. And if you’re wondering why it’s called cukesalad… It’s cucumber, washed and ready to eat. There’s something wrong with many behaviour specs (or acceptance tests). It’s been this way for some time. I’ve written about this once or twice before, referencing this post by Kevin Lawrence from 2007. Previously, the terms used by Kevin, myself (and several others) were Goal->Activities->Tasks. From now on, I’m going to use the UCD/HCI/Task Analysis terms Goal->Task->Action. It’s exactly the same model – just with different labels at the three layers of detail. What’s wrong with your average behaviour spec? 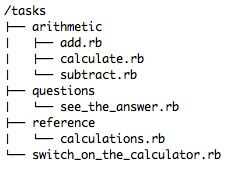 Let’s look at a common example… The calculator. For convenience, I’m going to borrow this one from the cucumber website. What would you say the scenario’s name and steps are representing? Goals and Tasks or Tasks and Actions? I’d argue that adding two numbers is a task and the steps shown above are actions. Instead, I try to write the spec (or test) with a scenario-specific goal and the steps as tasks. Then the top result should say "Cucumber - Making BDD fun"
When I search for "Cucumber"
In the calculator example, the outcome the business is interested in for the first scenario is that we get the correct sum of two numbers. The steps in the scenario should help us arrive at a shared understanding of what ‘correct’ means. How we solve the problem of getting the numbers into the calculator and choosing the operator is a separate issue. That’s detail we can defer. It may be better to explore the specifics of the workflow using, sketches, conversation, wire-frames or by seeing and using our new calculator. So, expressing our scenarios in terms of goals and tasks helps the delivery team and the business arrive at a shared understanding of the problem we’re trying to solve in that scenario. Expressing the scenario in terms of the clicks, presses and even fields we’re typing into is focusing on a solution, not the problem we’re trying to solve. If we put that detail in the scenarios, that workflow will be repeated everywhere – for addition, subtraction, division, multiplication… and anywhere any calculation is described. The correct answer hasn’t changed – i.e. the ‘business rule’ is the same – it’s just the sequence of actions has changed. Now we have to go through all the feature files and update all the scenarios. In the case of our calculator that may only be a few files covering add, subtract, divide, multiply. For something larger and more complex this could be a lot of work. Nothing else would need to change – other than the product of course. By writing the steps as tasks, all of our feature files would still accurately illustrate the business rule even though the workflow of the interface (gui or api) has changed. So, taking this approach helps us to reduce our maintenance overheads. Putting the Actions inside the step definition makes our tests less brittle. When the workflow changes we only need to update our specs in one place – the step-definitions. Of, perhaps, greater importance – by capturing the user’s scenario-specific goal as the scenario name and the tasks as the steps, the team are working towards a shared understanding of the part of the problem we’re trying to solve not a solution we might be prematurely settling upon. When rolled up with the broader context (expressed in the user-story and its other scenarios) it gives us a focus on solving the wider problem rather than biasing the solution. Sometimes, at first, it’s hard to see how to express the scenario and is easier when people start by talking of clicks, presses and what they’re entering. And that’s ok. Maybe that’s where the team needs to start the conversation. Just because that’s where you start, ask “why are we doing those actions” a few times, and it doesn’t have to be where you end up. In “You’re Cuking it Wrong”, Jonas Nicklas, shows several examples of bad scenarios (or acceptance tests whichever term you prefer) and demonstrates better approaches. This is an excellent post on common mistakes made when writing example scenarios with Cucumber. And I fill in "Gallery" for "Title" within "#document_form_container"
And I press "Ok" within ".ui-dialog-buttonpane"
Then I should see /Gallery/ within "#documents"
When I press "Add subpage"
And I fill in "Title" with "Gallery"
Then I should see a document called "Gallery"
This is a massive improvement. It keeps the specifics that inform the reader and give them some context (like filling in the “Title” with “Gallery”) and takes them further away from the implementation. Although it gets closer to expressing customer intent, I think it could go further. At the moment, it is describing the ‘what’ and some of the ‘how’. This example makes complete sense if what we are exploring is the design of the UI. I’ve not found these scenarios to be a good place to do that, however. Instead, in these specifications we want our examples to illustrate the customer intent. The ‘what’ not the ‘how’. There are other places we can capture the ‘how’ – i.e. in the step methods. When I Add a Subpage with a Title of "Gallery"
I’ve removed all the “Tasks” and left only “Activities”. This leaves the user experience completely open. This ensures that when there are UI changes, I only change the code that performs the tasks (clicking, pressing, etc.) and my scenarios evaluate whether the customer intent is still fulfilled – without having to go back and change a lot of files.